If you have Platinum status, you can now earn up to 7 free nights in Las Vegas or Atlantic City. That’s one night for every 5,000 Tier Credits earned during the calendar year. All other benefits should remain unchanged. If you have Diamond status (through status match, FoundersCard, or the traditional gambling path), you get the same rewards as before, the free night benefit for Platinum members, and two free nights at Caesars Resort Dubai. If you are a Seven Stars member, all of the benefits above apply to you as well. 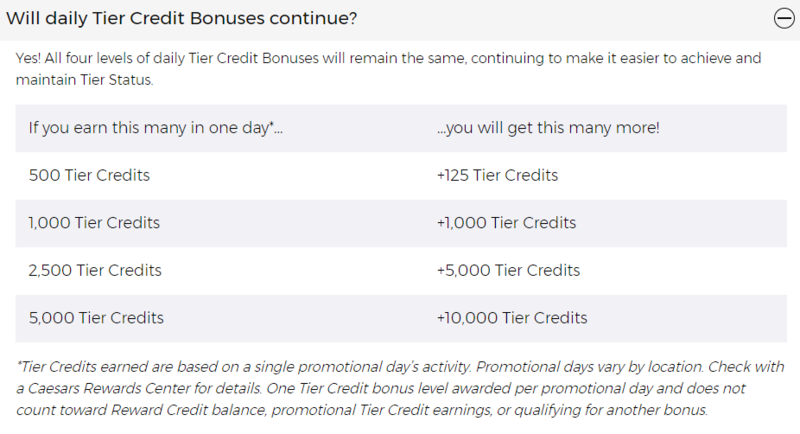 We aren’t seeing any new benefits announced for the top tier invitation-only level of Caesars Rewards yet. What are those tier credits about? Tier credits are the status currency of Caesars Rewards, and are earned through spend at Caesars properties. You earn 1 TC per dollar spent on eligible hotel, shopping, dining, and amenities. Slot machines earn 1 TC per $5 played, video poker earns 1 TC per $10, and table games, poker, and books also earn TC. TCs have no redemption value per se, and your TC balance resets every January 1. On the flip side, Reward Credits are the reward currency of Caesars Rewards, earned through spend, shopping and credit card offers, and you can also exchange Wyndham Rewards points back and forth. RCs are earned at similar rates to TCs, and can be redeemed for one cent per RC at most Caesars properties. As a bonus, if you pay for an entire meal with tier credits, you won’t be charged tax on it. Most earning methods will earn you RC and TC at the same time (so a $500 room folio earns you 500 RC and 500 TC), although if you use the Caesars Rewards VISA credit card, you’ll earn up to 5x as many RCs but no TCs at all (unless your spend is at a Caesars property with your Caesars Rewards number linked) . RCs expire after six months of inactivity. How do I earn Caesars Rewards status? The quickest way to earn organic status (i.e. through activity at Caesars resorts) is to gamble and take advantage of tier credit bonuses. Big parties or work dinners can also get you well on your way. As shown above, Platinum requires 5,000 TC and Diamond requires 15,000 earned during the calendar year. There is a not-so-secret way to accelerate your TC earnings though. If you can earn 2,500 TC in one “promotional day,” you receive a 5,000 TC bonus which earns you Platinum status in one day, and puts you halfway to Diamond. Do that twice and you’re Diamond. If you earn 5,000 TC in one day, you’ll find a 10,000 TC bonus brings you to Diamond in one day. The definition of “Promotional Day” can vary from property to property, and it should be 24 hours although it may not always be midnight to midnight. If you’re planning to spread out over a promotional day, check with the Caesars Rewards desk to see what the cutoff time is. What if I can’t earn status those ways? Not everyone will spend $5,000 in a day on property, or gamble $25,000 in a day, but luckily there are other ways to earn Caesars Rewards status. If you already have status with a Caesars competitor (such as the MGM Resorts MLife program), check the Diamond Status Upgrade page at Caesars website to see if you qualify for a match to Diamond. If you have Platinum or Diamond status with Wyndham Resorts, you can automatically status-match to Caesars (and vice versa). This does have to be renewed every year, but it is not a status challenge, so you can do it every year. If you don’t have either status, check out FoundersCard to see if you qualify. Among other benefits that can result in thousands of dollars of value over the course of a year, FC offers Caesars Rewards diamond status as a benefit. Join through our link here and we’ll get a bonus when you are accepted, which will most likely go toward further things to write about here on rsts11travel. Check out how we used the benefits to our advantage in this blog post from last year. The changes to Caesars Rewards are pretty modest, so it’s unlikely that someone visiting Vegas once a year will be wowed by these adjustments to the program. If you visit often enough (or gamble often enough) to earn 5,000 or more TC in a year, those free nights should turn out to be a good benefit. If you happen to earn 5,000 TC in one day, you’ll add a total of 15,000 TC to your balance (which might bump you back into free Diamond Lounge access if you’re already Platinum). The Caesars Rewards FAQ is available on their website, although we think the juiciest bits are covered here as well. You can also read their press release on the topic, if you’re into executive quotes and such. What do you think of the changes? Will they impact your loyalty or choices when visiting Las Vegas? Join us in the comments below.